Ahead of his visit to Kiev on Monday, May 17, Russian President Dmitry Medvedev gave an interview to the Ukrainian mass media. RT presents a full translation of the event. Q: Mr. Medvedev, could you please specify what kind of agreements are going to be reached, and what agreements have been signed? Dmitry Medvedev: To begin with, this is the first truly official visit by a Russian president in a long time. I am really glad to be here. I missed Ukraine. Well, I did go to Kharkiv, but it was a working visit, whereas this one is a full-scale official visit with all that that entails. But protocol is not the most important thing here, but rather our achievements. Recently we have taken some serious steps in order to restore sound, warm, sincere, friendly relations, which had been traditional for our countries. Together with President Yanukovich, this time I would like to take the following steps – there are a number of agreements that we have been working on – in the area of production co-operation, energy, humanitarian exchange, co-operation on inter-regional and international problems. As far the latter goes, these documents are usually signed by heads of states. There are a number of declarations and agreements on the issues of Black Sea security, the Trans-Dniester settlement and European security. This package is in the final stages. And I hope that by the moment of my arrival, we will come up with specific documents. Right now we are finalizing nuances. Q: Will you sign agreements on joint ventures in the aircraft industry, transport, energy? DM: All these issues are being looked into. We have good prospects for co-operation in aviation. We have a historic background here. Our major companies – I am talking about Antonov and the United Aircraft Corporation – are in direct communication with each other. A number of ideas are being considered. For example, continued co-operation on specific models, such as AN 140 and AN 148. There are even talks about assembling one of those models at our United Aircraft Corporation. The same with some other models of planes and helicopters. Will joint ventures be created? I don’t rule it out. But we need to come to final agreements on that. In any case, co-operation in the area of the aircraft industry makes total sense, because we have a similar, if not the same, technological basis. We share the same problems, because we need to stop making blueprints on paper, but start using digital technologies. In my country I’ve made it a priority – to digitise all our new models of cars, ships and planes. The Sukhoi Superjet is the first digitised model. It's a new model. But I think if we create something in this area, we need to go digital. Then it would be useful for Ukraine, because it would be a modern model, even if it's built on the basic one, and for our country as well. I would welcome such joint ventures. Q: Mr. Medvedev, I would like to ask about the agreements that you mentioned, and the agreements signed by you and President Yanukovich in Kharkiv in particular. Ukraine is still debating these documents. How did the Russians view the signing of these agreements? DM: I think the reaction was a lot calmer. I looked at the numbers – the overwhelming majority of Russians support these agreements. Of course, there are different opinions. As you know, I pay attention to what is written on the Internet and in the press. From what I saw, after President Yanukovich and I signed these agreements, there was not only praise, like "Good job on settling a very important security issue. You helped out our Ukrainian partners by cutting the gas price". But there were some sceptical comments too. But the majority were very positive, because our people see it as a symbol of restored partnership in the wide sense of the word. They see it as a symbol of trust, looking into the future, a desire to build relations not only here and now, but for the duration of one presidency, so to speak, of one cadence, a legal term which is not that widespread in our country. These agreements look into the future. I am talking about the prolonged stay of the Black Sea Fleet in Sevastopol and a special reduction on the price of gas for Ukrainian consumers. I think that this is a combination of balances, helpful and mutually-beneficial agreements, which, and I say it again, look into the future. How about your country? What was the reaction? Answer to Medvedev: The reaction was diverse. Some people totally supported your view, saying that this means looking into the future. Others think that Ukraine compromised its principles and gave up its national interests. Of course, there are extremes. The truth is, as always, somewhere in the middle. DM: Why am I asking this? Of course, it is an internal matter for Ukrainians, just like the attitude of our country is an internal matter for Russians as well. 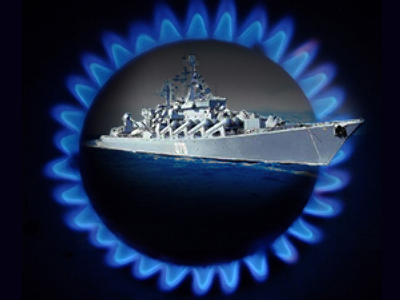 But according to the poll results that I have, and these polls were taken before President Yanukovich and I reached these agreements, even at that point, about 60% of Ukrainians supported extending the lease for the Black Sea Fleet in Sevastopol under certain economic conditions, beneficial to Ukraine. So I think in this respect the Ukrainian side is satisfied to a degree as well. Sorry, I interrupted you. Q: That's OK. Mr. Medvedev, your Ukrainian counterpart Viktor Yanukovich recently spoke on the idea of a merger between Naftogaz and Gazprom. He said that it is impossible to do it on equal terms, as Ukraine would like to. At the same time Ukraine doesn't want to be a minority shareholder. Are you not upset by the refusal? What do you think about the prospect and feasibility of such a merger? DM: I am not hurt by the refusal, because I haven't discussed the issue with president Yanukovich yet. There has been talk about it, but we have not discussed it yet. That's the first thing. Secondly, mergers and unions should be pragmatic. No matter how much we like each other, we should not go for any mergers if there is no pragmatic reason for it. But alliances are not only possible, but sometimes necessary. I will not analyse now how we can merge Gazprom and Naftogaz. Firstly, it will not be productive because there have been no talks on this issue so far, and secondly, because such analysis requires accurate calculation. Let me remind you that according to different assessments, Gazprom is valued at between 150 to 200 billion dollars, and Naftogaz a little less, with all due respect to it. But we are not talking about just a merger, because it might cause difficulties for our Ukrainian partners and for co-operation in general. I mean if we speak about joint projects and joint ventures where different gas and logistics facilities will be joined, not by a direct merger but by joining separate sectors, for example, then it would be quite possible on a mutually-profitable basis, observing the desires of both sides. That’s the kind of project we have not only with our close friends like Belarus, but also with some European countries, with such big companies like E.ON, the main German gas company. We work with them according to the model of merging several assets. On the one hand it’s easier and on the other it gives good results. Finally, let me remind you, there are a number of big foreign shareholders in Gazprom. When they made investments, it was one sum of money and now it’s a different sum, because the biggest package of shares, of 6%, belonged to our German partners, if I’m not mistaken. I know all the details because I was Chairman of the Board of Directors of Gazprom for a long time. At the peak of capitalisation it was 20 billion dollars, considering the fact that their investment was about 15 times less than that. That’s why it’s an issue requiring accurate and detailed analysis. As for me, I won't refuse anything and won't anticipate much. We should discuss everything with President Yanukovich first. Q: Mr. President. A week ago here in Gorki at the informal meeting of the CIS leaders you said that all of them are ready to co-operate with Ukraine with the utmost fruitfulness. Did you mean any specific projects and initiatives we do not know of yet? DM: [laughs] No, we did not speak about anything you don’t know about, because we have open co-operation; and Ukraine is a participant of the CIS as well as the others. Ukraine did not leave the Union. And nobody tried to isolate it. We had difficulties in communication with the former Ukrainian president and disagreements with the former government. But even during that period we met and made decisions together at summits, for example on the Strategy of Economic Development of the Commonwealth for the period up until 2020. It may seem quite an abstract thing, but in fact it’s very important. We are to realise the prognosis for our further development, because it’s closely related to our mutual trade and investment plans. I’ve studied some figures – I cannot fully explain them by the change of president and government in Ukraine, although it seems to have played its role too – our commodity turnover for the past three months, from January to March inclusive, reached 7 billion dollars. It means it has almost doubled. Of course our overcoming the crisis has influenced it, but it’s also the result of the new team coming to power. That means that we can return to very serious figures, the figures we had before the crisis. And I am sure that both economic and political factors play their positive role here, because a significant number of programs were frozen, which is actually very sad. Q: And which programs can be unfrozen? DM: The ones we are talking about right now. We could easily move forward with aviation and space co-operation, including navigation systems like GLONASS. It’s a mutually-interesting area of co-operation. There is the Dnepr [Dn-YEP-rr] program of launches, in the field of space. There are a number of ideas in the sphere of energy, which I have mentioned already. I do not mean here direct co-operation between Gazprom and its Ukrainian counterpart. I believe we can think of Russia’s participation in the modernisation of a few big industry facilities, which are located in Ukraine. And of course it is to be done on a mutually-beneficial basis. We really had good co-operation. If we manage to restore it, commodity turnover will definitely go up. And not only thanks to an increase in the total amount of delivered energy resources – oil and gas, of course they influence commodity turnover too, – but especially due to technology and high-technology projects. Q: Mr. Medvedev, industrial co-operation may have an immediate effect and payoff from this mutual work. What’s your opinion, do we need to assist here or just provide state support to the businessmen of the two countries, or simply not interfere with their work? DM: I’ve been in business for 10 years and I think that it’s better not to interfere, but it won’t be that way anyway. The state regulation and bureaucracy are such that they will definitely interfere. Well, to answer seriously, I think that we are to give an impetus to businessmen at state level. That’s why during my visit I plan to hold not only official meetings – negotiations with the president and interstate commission between Russia and Ukraine – but I will also meet with businessmen. I find it useful, especially taking into consideration that many contacts have been suspended. I will not hide it, in a few cases Russia has claims which we are working on now, about the misuse of Russian investments. Unfortunately, it was related to the inter-political disputes which happened in Ukraine during that period. But anyway we’ve got to move forward from this situation and do our best to create a favourable investment climate. That’s why I wanted to meet with Ukrainian businessmen. There should be an impetus on the part of the state, but as for the state’s and the government’s direct control over investments and projects, I do not always find it productive, especially when we are talking about private investors. They should establish relations on their own. The state’s task is to protect their investments. There is a so-called concept of a state acting like a night watchman, and although it’s an exaggeration, all the same the state is to be on guard for investments, and the business elite should be in charge of business contacts. Q: Mr. Medvedev, the Ukrainian opposition is sure that such a radical turn in relations with Russia and the intensification of cooperation is, in fact, aimed at dragging Ukraine into the Russian sphere of geopolitical influence even stronger than it has always been. What do you think about that? There are also people who believe that this will make it impossible for Ukraine to become a member of the European Union. Do you think that Ukraine should really be afraid of such a close friendship with Russia? DM: You know that Ukraine is not homogenous. We’ve already said that various opinions exist both in Russia and Ukraine. I think that Ukraine has nothing to be afraid of, everything is absolutely fine. As for our relations a year ago, there were simply none. How can we speak about dragging Ukraine into somewhere if we didn’t have any relations at all. I refused to send an ambassador to Ukraine because our relations were practically brought to naught. Our business contacts were also frozen. Yes, of course, we continued delivering oil and gas. But we simply couldn’t do without that. These are our contractual commitments. But we cannot speak about any full-scale relations, they were simply cut down. We are now only starting to develop them again. I am not saying that we’ve elevated them to unprecedented heights. 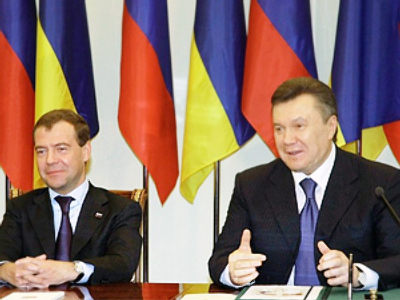 President Yanukovich and I have met six times in recent months. These are very intense contacts, and we are going to meet each other for the seventh time when I come to Kiev. I think that we are refilling the gap which has been created in recent years so as to, at least, bring these relations back to their pre-crisis level. Let’s wait and see what happens next. I would like to emphasize once again that this should be done proceeding from our national interests, both Russian and Ukrainian, and our vision of what we want on a completely pragmatic basis. But, at the same time, we should understand that our countries have special relations with each other. These are the relations of close neighbors and relatives, relations that have historical roots. So, it’s simply impossible not to take that into account. The Kharkov agreements are also linked to that. If it were otherwise, we would have never been able to reach such agreements. These, of course, are very special agreements. As for whether that’s going to help or aggravate something, I will be absolutely sincere if I say that this is unlikely to hinder anything. If the Ukrainian people decide that they should seek to join the European Union, this is your choice. But, as a matter of fact, any choice should be reasonable. All of us are participating in European integration. Let me remind you that Russia’s trade turnover with the European Union has reached 250 billion dollars, and this is serious. That is why we are very closely integrated with Europe. If you think that it’s interesting for you too, you should work on that. It’s obvious that we all belong to the European family. It’s normal. But to speak about EU membership, this is a question for Ukraine and the European Union. Anyway, I would keep watching very closely all the current developments in the European Union because one should seek to be where it’s safe and sound. But at present our European colleagues have to overcome the difficulties that they are facing, including the situation in the euro zone, the insolvency of a whole number of states, etc. They, in turn, will also look at how economically attractive are potential members of the European Union. Q: But at the same time the Russian opposition has already said that Russia has paid too high a price for extending the term of stay of its Black Sea Fleet in Sevastopol. DM: Has our opposition stated this? DM: Well, it’s great. It shows that the opposition has its own vision of things. It shows that the opposition is alive and wants to announce itself. I think that it’s normal. It’s also true of the opposition to President Yanukovich which said that the whole thing was bad, that it almost meant selling national interests, etc. But the main task of any opposition is to criticise the authorities, and the authorities should be ready for this criticism. Their reaction to it should be calm, but they should continue to firmly pursue a course which they deem right. Q: I just wanted to clarify why it’s so important for the Russian Black Sea Fleet to stay in Sevastopol? DM: You know, apart from our special relations, brethren historical relations, but I will put that aside now because this is an implied condition. In any case, we are very close nations and we will still continue developing together side by side even in view of our geographical location. There’s another important subject. It’s European security. The thing is that, in my view, the present-day model of European security is not ideal, and the events of recent years prove just that in all evidence. The events surrounding the disintegration of Yugoslavia, the 2008 Caucasus crisis, all this shows that we don’t have an optimal model of settling disputes and conflicts that arise in the European space. To achieve that, we need to create the right legal foundation. In the first place, that would resemble the one which I proposed, although I am not claiming to be exceptional. There can be other proposals but something should be done. What I mean is a European security treaty, a new treaty that would, in fact, continue a process started in Helsinki in 1975 while the Final Act of the Conference for Security and Cooperation in Europe was being prepared. Second, we understand that even with the presence of a whole number of military blocs, security in this respect is unattainable in full measure. Europe has NATO. Yes, it’s a military bloc that has survived after the collapse of a two-bloc system after the Warsaw Pact ceased to exist. Europe has other military and political alliances such as the Collective Security Treaty Organisation of which Russia is a member. Does it mean that the whole of Europe is divided into blocs and everything is calm in this sense? No, it doesn’t mean that. This is exactly why I think that preserving a configuration which currently exists in Europe is a certain guarantee for its stability. As soon as any kind of vacuum emerges, there’s a temptation to fill this vacuum with something. European history knows many such cases. I am not talking now about the reasons that stood behind the collapse of the Warsaw Pact, for example. They are obvious. I am not even saying whether that was good or bad for Europe. Let historians decide that. But I would like to say that if such geopolitical changes, which on the whole may have liberated Europe, hadn’t happened, there were still negative consequences from all this. Let’s speak about processes linked to the disintegration of states which unfolded according to a very difficult scenario like, for example, in Yugoslavia. Its disintegration was clearly a consequence of those processes. That is why I think that the ongoing presence of our naval base is at least the preservation of a balance of forces that formed quite a long time ago. This is a guarantee against any desire to re-divide anything in the sphere of European security. By saying that, I am talking not only about consequences for Ukraine and Russia but for the rest of Europe. That is why, in my view, Europe and NATO had an absolutely calm reaction to our agreement with Ukraine on prolonging the terms of the presence of a Russian naval base in Sevastopol. This is wise. Q: I would like to ask you, taking account of very close relationship between our two countries, of which you’ve just spoken, I know that your mother’s genealogical roots go back to somewhere in the Belgorod region. DM: Yes, that’s true. The fact is that my mother’s relatives do come from there. My grandparents’ surname was Kovalev. But, as my grandmother explained it to me, it means that my great grandfather’s surname and, consequently, the surname of my ancestors was simply Koval and not even Kovalenko. So it’s obvious that it creates an affinity with those who live in Ukraine. But, I don’t know how deep those bonds are. It’s also obvious, you know, that they had a certain micro-environment because my grandmother had a higher education. She was a trained and educated person. But, nevertheless, all her life she spoke a language which contained separate elements of the Surzhik. So, it was quite an organic medium for me when I visited them. They lived in Voronezh at that time. Unfortunately, I’ve never been to the Belgorod region but I am planning to visit it. That is why I have great interest in my family’s history and in the interrelationship between my family and my surname with my relatives who lived in the territory of Russia and Ukraine. Well, I am going to dig up more facts. Let’s see what else can be found there. Answer to Medvedev: Thank you very much for your answers for Ukrainian TV viewers. We are waiting to see you in Kiev, in Ukraine. DM: Thank you. I’ll be there soon. Please, prepare nice weather for me. Agreed?